Summer is drawing to a close and the days are getting shorter, but there's no rest for the wicked as the Gfinity Challenger Series Delivered By Domino's marches on into the seventh and FINAL week of action. Unlike the temperature outside, the action remains white-hot, and our players continue to impress in the battle to secure the best possible places in our Gfinity Elite Series Draft Delivered By Domino's. Rookies, veterans and everyone in between are all in contention for draft picks and a prized place in the Elite Series, and you can bet that all of our Elite Series franchises will be paying close attention to every game played, every goal scored and every whiff punished. So no matter if you are a franchise scout or regular Gfinity fan reading this, hello – let's get down to business and recap what happened in Week 6! The 'new leader' klaxon is going off again, as the top spot on the Xbox One table has changed hands once more. And this time it's former Elite Series draft pick BeastTekkerz who has romped to the top of the table, having enjoyed an absolutely barnstorming week with the highlight being a big Cup win on Thursday night. With a total point haul for the week of 1260 points, he storms out into a commanding lead on 4000 points, a whole 730 points ahead of Rxbbie_ in 2nd on 3270 points. Last week's leader DNG PadrePio 96 slips to 3rd on 3250 points, ahead of night_watch on 3130 points in 4th. Behind the top-4 there's a 660-point gap down to xImpact on 2470 points in 5th, who has managed to consolidate nicely after a strong couple of weeks and cement his place in the top-10. Diogo1906 sits 6th on 2420 points, with Krompe (2400), iITZz MaXi (2330), BradleyHodgson (2220) and AngryxMiche (1890) complete the top-10 – the latter arriving in the top-10 after a Cup win on Monday and a nice 530-point haul for the week. Over on the PS4 table we have another new leader, and what a blistering week it has been for Renzo Parave. Not one, but TWO Cup wins on Tuesday and Thursday, as well as a top-4 on Monday and a top-64 on Wednesday; all of that adds up to a staggering 1620 points in four days. For context, coming into this week Parave had 1680 points for the entire Challenger Series Delivered By Domino's season so far. So having almost doubled his point tally for the season in just one week, it's no surprise that he has soared up the table from 5th to 1st on 3300 points. Turbulance1 is knocked down to 2nd as a result, but with 2940 points is still very much in the hunt, as is Danny Taylor in 3rd on 2870 points, Deniss in 4th on 2610 points and LostInTheWavez in 5th on 2560 points. DAGNOLF96 secures 6th on 2220 points ahead of retegann in 7th on 2035 points, and we welcome a new name to the top-10; Lukas_1004 taking 760 points this past week with a Top-2, Top-4 and a Top-32 finish to move to 8th on 2020 points. KalanC and ThomasLeese7 wrap up the top-10 on 1960 and 1910 points respectively. We could see this coming, couldn't we? The rising star has ascended to the top of the table as Kassio's incredible run of form continues – he moves to 4770 points, just 10 ahead of Fairy Peak in second. And unsurprisingly, he has brought his all-star teammates with him – Elite Series Season 2 champions Rix Ronday and Borito B now sit 3rd and 4th on 4390 and 4330 points respectively. The trio has been absolutely unstoppable of late, racking up a third consecutive Thursday Cup win in as many weeks in a jaw-dropping run of form. This week also saw them take a runner-up and a Top-4 finish, as they each racked up 1250 points in one week – phenomenal form. Any doubts about Ronday and Borito's talents after a slightly inconsistent RLCS and Elite Series Season 3 campaign earlier this year are being spectacularly assuaged, and Kassio will be top of everyone's draft pick lists if he can maintain this form. Speed_RL completes the top-5 on 4210 points, with the top-10 being completed by Mout on 4110 points, KayDop on 3610 points, Yukeo on 3190 points, Kuxir97 on 3070 points and Ronaky on 2720 points. In contrast to FIFA 18 and Rocket League, the SFV table is largely business as usual. NastyNas continues to lead on 4135 points, as his mission to fight his way back into the Elite Series for a third consecutive season continues to go from strength to strength. Behind him remains Verdoyance with a similar ambition on 4109 points, and in 3rd now sits Hurricane – the Elite Series Season 1 champion showing that he will continue to be a huge threat for exceL when Elite Series Delivered By Domino's Season 4 rolls around. Shivs slips just behind on 3205 points in 4th with Manxas completing the top-5 on 2812 points. As for new names in the top-10, a Cup win on Tuesday and a top-6 on Thursday means Elite Series veteran JonesArcade moves into 9th place on 2224 points, only adding to the huge amount of Elite Series experience to be found in the top-10. Elsewhere it's Naught in 6th on 2702 points, Kilzyou in 7th on 2483 points, Gun Slinga in 8th on 2283 points, and GreenSoap just behind JonesArcade in 10th on 2174 points. There's still a huge amount of movement on all our leaderboards, and nothing is ever guaranteed. And remember, you could still be in with a chance of cracking the top-30 and beyond in each division. 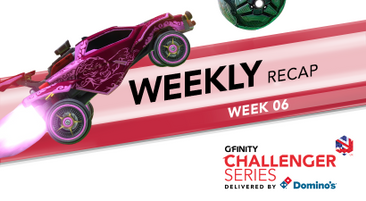 Join the last week of the Challenger Series today! Welcome to the Gfinity CS:GO Spring Series 2018 Playoffs!